It was announced yesterday that Mars Hill Church in Seattle will no longer have campuses. They will now call them "churches." 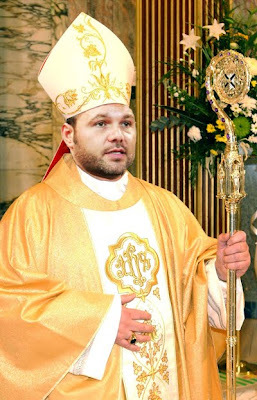 You know what this means now, of course - Say hello to Bishop Mark Driscoll! In all seriousness, it makes no sense to me for churches who follow a congregational model to adopt what is, in essence, an episcopal form of church government - minus the pageantry. Hopefully the picture isn't taken as being too inflamatory. All in good fun, I say! Go ahead and put up a picture of Ligon Duncan in a J. Crew polo with the collars turned up; won't bother me in the least! Thanks for the post. After the C.J. Mahaney & Sovereign Grace drama, I am praying that the church will begin to think critically about ecclesiology again. The subject has been ignored too long. Quotes like this trouble me more than Mark Driscoll wearing a cassock next Sunday (I am sure it would still say “Jesus is my Homeboy”). I don't know of any title to give a pastor who oversees a region of churches and believes all of his churches to be a "single, unified church." Does anyone else find this alarming? A "church of many churches" is a strange concept to me. Is this just their way of trying to still be congregational but at the same time CLEARLY adopting a hierarchical church structure? The two impulses simply do not mesh well, in my opinion. I think it is just a case of ecclesiology being ignored until it is too late. Also, changing ecclesiology that is so pragmatic is not easy. If I followed the article right, the "pastors" of the other Mars Hill "churches" are truly the pastors of their respective church? Are all pastors of the Mars Hill enterprise made equally? If so, is Mark Dever the first among his equals? I fear a schism is brewing. Long live Pope Dever the 1st. May his seed and legacy be strong. May the gates of Hades never prevail against the See of Seatle. Mars Hill has been an episcopate since the by-laws got revised in 2007, though I seriously doubt MH leaders would describe it this way on record. It's been a denomination in all but name for years but the leadership at MH is very eager to avoid stating this on record. As they'll see things elder rule has never been compromised and elder rule is where they've always landed over at least the last thirteen years. There's little to no risk of schism, though, since for a schism to happen Mars Hill would have to admit it's a denomination already. Driscoll still does 70% of the preaching each month by way of video venue through a week-lag and DVD deliveries. Dever is over at Capitol Hill Baptist, Jacob. I think you meant Driscoll, right?